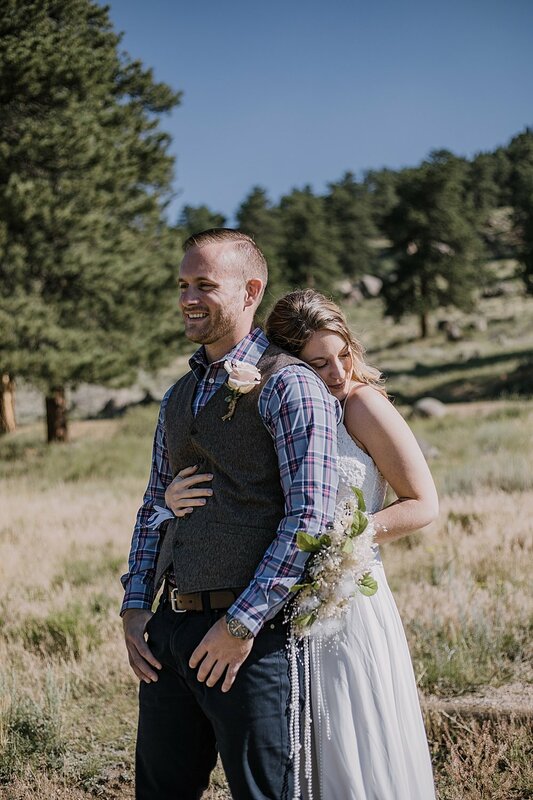 Does anyone else really have a better reason to elope in Rocky Mountain National Park other than a park ranger himself and his lovely fiancee? Nope, but I would highly encourage those considering eloping in Colorado to do so here! It is honestly one of the most beautiful places to elope with miles and miles of hiking trails, stunning alpine lakes, and daunting mountains to climb. Morgan and Geoff wanted an organic and simple ceremony at 3M Curves with their favorite mountain, Long’s Peak, in the background. They also chose Rocky Mountain National Park because they wanted to be surrounded by their biggest passion, the wild outdoors! 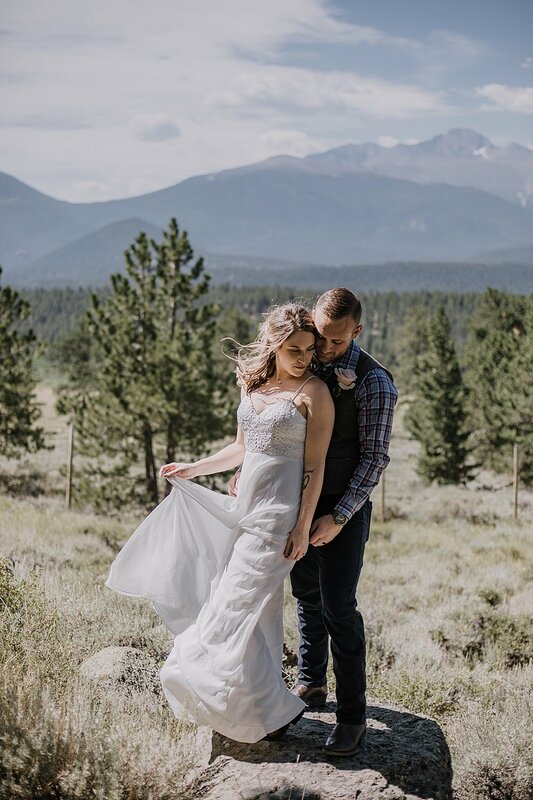 I hope you can see why Longs peak is their favorite - it made for a really beautiful natural backdrop for them to exchange their private vows. During our first conversation over the phone, Morgan told me the story of how her and Geoffrey met. These two found each other in Florida after Geoff got out of the US Marine Corps. They were instantly inseparable and spent their time planning adventures and trips together. Both decided to leave their jobs and spent an entire summer traveling to different National Parks before making the move to Colorado. Geoff added to this by saying that they met online and when Morgan visited him for the first time, he took her out and showed her around the town. On their first date, they went for an evening stroll at the lake and afterwards headed to a local burger joint. When they placed their order the burger place told them that they were out of food and couldn’t serve them! So, (it being quite late already) they headed to Walmart to buy snacks. At one point Geoff peeked his head back around the aisle Morgan was walking down and looked at her before saying, “I’m so glad you’re not crazy.” Morgan says that’s when she knew he was the one and they’ve been together ever since! On the day of their elopement, I met Morgan and Geoff at the Wildwood Inn in Estes Park where Morgan was finishing getting ready. We had planned a first look and as Geoff and I left she went to put her dress on. We pulled into the entrance of the National Park and Geoff was greeted by another park ranger who had a big smile on his face. He said he almost couldn’t recognize Geoff without his uniform on and that he cleaned up quite nicely! We all laughed as he congratulated Geoff and then we took off towards 3M Curves. Geoff pointed out several spots along the way and gave me bits of history about the park, the elk, and the moose that call Rocky Mountain National Park their home. We arrived at 3M curves greeted with a stunning view of Long’s Peak in the distance. We had the absolute best weather that morning - the sun was warming up fast but the altitude made the air feel like spring. (This is super nice for summer elopements as grooms aren’t sweating through their suits!) Geoff and I hiked around the surrounding area looking for the perfect spot for them to say their vows. We settled on a rock outcropping that rose above the meadow where a clear view of Long’s peak stood as their witness. Happy we had found the right location for their ceremony we hiked back towards the beginning of the trail, just as Morgan pulled up to 3M curves and parked. Morgan walked towards Geoff’s turned back as her dress waved in the gentle breeze. She looked so stunning! She hugged Geoff from behind and then took a step back so that he could turn around. First looks are simply my favorite - they pull on my emotions (and the couples emotions which is way more important haha - just expect me to be wiping away my own tears) like nothing else. Morgan eyes glistened as Geoff pulled her in close and hugged her tight. If there’s one thing that makes elopements incredibly special, I think it’s the intentional time placed on being present with one another (and a few loved ones if you choose to have others join). We spent the rest of our time exploring and taking portraits throughout the 3M curves area. We even found a deer skeleton that had brush growing up through its ribcage! After we returned to the Wildwood Inn, Geoff and Morgan headed out to grab food and get massages - I was so jealous! I really loved that they made their whole elopement day an experience which is honestly what your elopement should be; an emotional, intimate, beautiful celebration of your lives coming together. There’s no wrong way to do it so when you start planning, make it your own!